Nice simple mirrors. I bought two of these for my master bedroom night stands. Looks great. Switch from an ambient glow to a bright light for reading at thepull of a chain with this two-light Quinn table lamp from iNSPIRE Q® Bold. Practical and inviting, this elegant lamp easily changes the mood of a roomfrom soft to strong, and its classy lines are a great complement to any modern home. 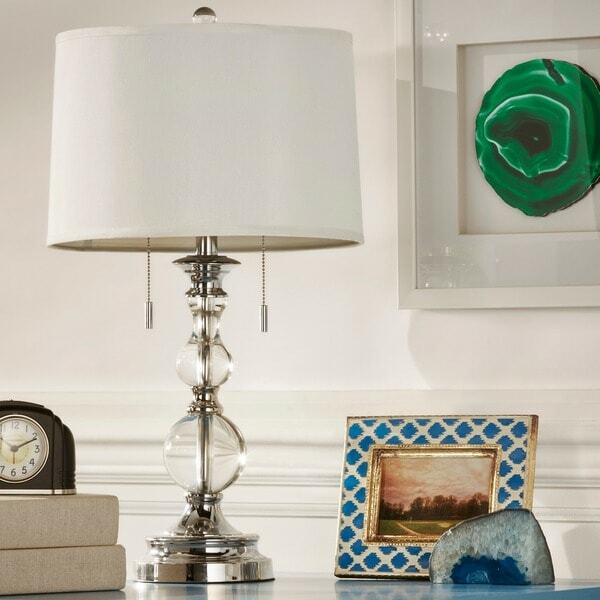 Made with metal in an attractive nickel finish on the base and pulls, the lamp is an illuminating addition on a side table in the living room, at your bedside table, or in your den or study area. Pros: Lamp has substantial weight. Lovely crystal reflects the lamplight. The pull chains give the lamp an elegant look. Cons: When the lamp is turned off, the lamp shade is bright white. It is not "off white" as stated in the description. When turned on, the lampshade is a soft vanilla. The lamp is described as having a nickel finish. This is a "polished" nickel finish and is very shiny. Since I was expecting more of a "brushed" nickel finish, it was a little disappointing. However, I should have asked before purchasing, so this one's on me. Also, there is a thin piece of felt on the bottom base of the lamp which is coming unglued. Since the base of the lamp is hollow, the felt functions as the lamp's bottom and will have to be re-glued. This is a nice lamp for the price. However, had the description of the lamp shade been accurate, I would not have purchased this product. Exactly what I was looking for to update my new bedroom. Packaged so well It took me 15 minutes to get it out! easy to put together and the lamp is so well made. I hit a home-run on this! Love the 2 switch options and the chains hang very well for easy reach. Looked for what seemed forever for the perfect lamps in my bedroom. Wanted a lamp that was elegant but yet had substance. These lamps are perfect. Wasn't sure if I would care for the double chain (each light bulb is controlled by one chain and there are 2 light bulbs) as I was used to lamps with that worked with a 3 way bulb. Don't mind the chain pulls at all. Puts off a small or large amount of light. I was very impressed with the weight of these lamps- they are very heavy and would not tip over easily as some lamps do. Excellent purchase and value for the money. I was impressed. This lamp is gorgeous! Its weighty and well made (except for the piece of felt on the bottom could be a little thicker). Its a fantastic value. The shade is an off white (like the picture), eggshell cream when not lit and when lit it is more of a light tanish color. It holds two bulbs which are mounted sideways and not up and down. Worth getting a new shade if you don't like it as the lamp alone is well worth it. The base is a mercury polished finish and the crystal is clear and a nice quality. I have this in my living room but could work anywhere in the house and would make a bedroom elegant. I loved this so much I bought another and its matching floor lamp. First, you get one lamp, not two. If you want two, you have to buy two which is what we did and WOW, they are beautiful! They're easy to assemble, and are very substantial in weight. We love the fact that they combine modern and classic style which works so well in our bedroom which is really a mix of old and new. There are two bulbs in each lamp so that is how you control how much light you want. We've been looking for just such lamps for about 2 years and I am very happy we waited until we found these. I needed a sturdy reading lamp for my bedside table. This is it. The chains are so easy to find in the dark and there are 2 bulbs for more than enough reading light. Very good purchase! These are very nice lamps. They are heavy and well made and would work well with any traditional/transitional decor. Like everyone else, I find the pull chains to be really convenient as well as the option to turn on one or two light bulbs depending on whether I want ambient or reading light. Took off one star because the shades are not of the same quality as the lamp and they should be a little longer so that you don't have to look at the bare bulbs if you're next to the lamps. Still, the lamps are worth it and I'll find new shades eventually. This is the lamp, if you have ever had doubts about ordering a crystal lamp, throw them away because this is what a quality lamp should be. It is heavy and just elegant. The picture does not do it justice. Very pleased, thank you overstock for having so many items to choose from. I ordered one thinking "2 lights" meant pair, oops!! This is so pretty, the 2 lights give option to be brighter with both on. The base is so sturdy, very hefty. The hanging chains add even more elegance, absolutely love it, so much I ordered that second one! Whoever packaged these should work for defense department!!! I ordered a lot online during home makeover but this is absolutely the best purchase!! So many compliments, one friend ordered her own!! This lamp is a nice addition to my bedroom. I paired it with a similar lamp and the Clay Alder Home Jericho Indoor 3-light Chrome/Crystal Chandelier at Overstock.com for the most beautiful bedroom lighting ensemble. The shade on this lamp provides a nice glow in the room, but has the ability to add a second light bulb when extra brightness is needed. The lamp has a nice weight to it and the crystal base is gorgeous. I am very happy with this lamp! This set has an amazing quality, it look experience and would give to your room a girly and elegant look. These lamps are the Ritz Carlton of lamps; beautiful, elegant, classy. So glad I purchased them for our bedroom. I have been waiting and searching and finally found what I was looking for on this website! This is a stylish and well made lamp. The shade is not the most attractive in my opinion, but I will replace it eventually. Love this lamp! Wonderful replacement for old bedside lamps. The pulls work smoothly, providing more than enough light. The lamp is substantial in weight, so no inadvertent tipping over, and the style is clean and light. An excellent product! Much higher quality than I expected for the price! SOLID base-no tipping over or having to hold the lamp when you pull down on the light switch and the crystallize orbs, sparkle when the light is on. The shade is well constructed with little threads of silver, just enough for a slight shimmer. I recommend purchasing this product. It is exactly what I was looking for. I like the style and the two pull strings. I would recommend to a friend. These lamps are pretty and substantial- great product at a great price. Sturdy lamp - looks expensive. The shades appear to be an off-white - but when lit, they are more warm in appearance. (I do not use bright white lightbulbs as I don't care for the fluorescent light.) Pulling on the chains to turn the light off and on does not result in any topple. I used a 15 watt bulb and a 60 watt bulb in each lamp to allow for ambience in my bedroom and the ability to read. I am pleased with my purchase. Love this lamp. It is perfect on my nightstand and was very easy to assemble. Because its a neutral color it goes with many different decors. Simply beautiful! They MAKE the living room. Classy really lit up the room i got 2...love them. I purchased two of these lamps to use in my master bedroom. They fit perfectly on my existing night stands. And they look wonderful! This is just the “look” I wanted! I couldn’t be happier with my purchase. Beautiful lamp - nice weight. looks great in the living room. Would have given 5 stars but one of the lamps (ordered 2) was defective and I returned it. Overstock was great about the return but am still waiting for its replacement so that I can complete my decorating. Pretty and functional. Replaced a lamp that didn’t give good light. Easy to turn on and off. "Is it a 3-way light or one way?" The lights are one way, but since you have two bulbs that are operated separately you can still have a range of light. "The description says, "metal with faux crystal globe construction" Are the globes made of glass or plastic?" They are a heavy acrylic. They feel like glass to me. When touching the globes they are cool to the touch. Acrylic is usually not cool, it usually is room temperature. These lamps are gorgeous and I bought them for our bedroom. My husband does not like fru fru decor and he loves the lamps, especially the pull chains. This was a 5 star buy for me ! "How much does this lamp weigh?" It is solid and fairly heavy - around 5 lbs. "What is the full height of the lamp including stand and shade please." The INSPIRE Q Quinn Crystal Mercury Base 2-Light Accent Table Lamp Overall Height is 26.5 inches high. "In the features, you have it as set of 2. These listings often have mistakes." This lamp comes one table lamp per box. We apologize for the confusion. "Hello, I would like to ask if this item is a set of two lamps because I've read that it is and I read from the Questions and Answers that says its only one lamp. In the Specs it says that it is a set of two lamps. I would like to purchases can you please give the correct number of lamps. Thank you!" This comes with one lamp per box. This is currently being updated. Sorry for the confusion. "In the description it says this is a set of 2, is that correct?" Hello dray30, this lamp comes with one lamp per box. Sorry for the confusion. Thank you for shopping with us!